The Society AGM was held on Tuesday 17th October. The Officers reported on the affairs of the Society. The Accounts showed we are still in the black. A programme of speakers for next year was discussed. Peter reported that interest in the website was waning a little but the Facebook page was going strong. It was also decided to have a social gathering at the Church Inn on 9TH December rather than the usual Christmas Buffet. David Blood suggested a joint event with the Friends of Heaton Hall, which would be a talk about the 18th Century landscaping by William Eames followed by a walk around the Park. David Stanley agreed to continue as Acting Chair and the other officers are to continue. We are grateful for David’s contribution over the last two years. But we could do with a Chairman and a few more Committee members. After the AGM business was concluded Alan Wentworth gave an illustrated talk about the history of the Church Inn. Alan is researching the Inn, not just with the pen but with the spade as well, having done several digs around it. 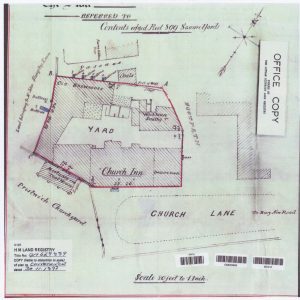 He showed the Tithe Map of the area from 1839 and spoke about a doughnut of land surrounding the Inn and Parish Church called ‘Eckersall’s Tenement’. This was first mentioned in 1561. Alan ran through the various names the Church Inn has been called in the past – Church House, Ostrich Inn and finally Church Inn. Church Houses were the social clubs of the Parish, raising money for the Church and the Poor, so the Church Inn might have started off as that in the Medieval period. Alan showed old photos and views of the Church which showed fascinating details long gone, of brew houses and stables etc. He showed one controversial view of the Inn and the Church drawn by Cleland in the early 19th Century. It seems to suggest the churchyard wall ran to the left of the Hearse House and that the Hearse House opened directly onto Church Lane. Everyone enjoyed Alan’s talk and he was thanked warmly. The next meeting is on 14th November and is about the Alexander Technique by a local practitioner. 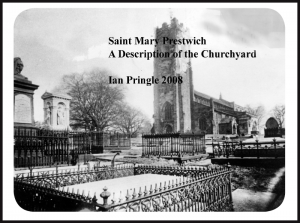 Our website is www.prestwichheritage.co.uk and we are also on Facebook. Below a plan of the Church Inn from about 1900.